Our Sock Hop party plans continue on. 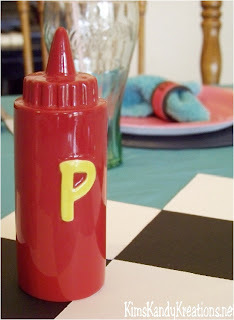 Today, I'm showing you my Fifties Dinner Tablescape. 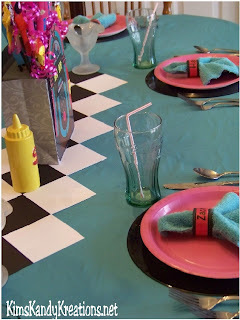 I kept my turquoise and hot pink color that's running through my Sock Hop party. I couldn't find a cheap tablecloth in a matching color, so I hit the bed sheet section at Walmart. They have colored sheets, and if you purchase the Twin size flat sheet, you can get a tablecloth for only $4.00. I fell in love with the Black and White checkered flooring of the old diners, so I made a matching table runner to go down the center of my dinner table. To make that, I simply cut 4 inch squares of black and white card stock and taped them together on the underside into a diagonal square pattern. Turned out CUTE! I used the Juke box candy bouquet that I made HERE as the centerpiece of my table. 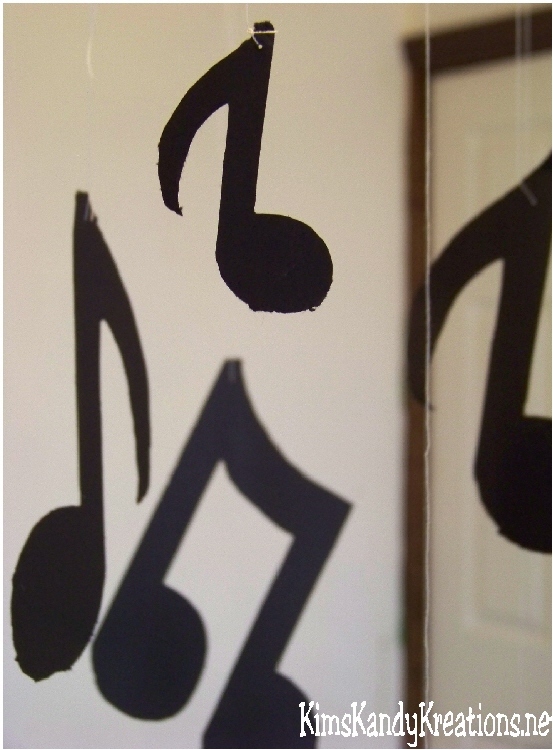 I cut out music notes with my Craft Robo onto black card stock and hung them from the chandelier above my table. It hangs right over the Jukebox so it kind of looks like you can actually see the music playing. 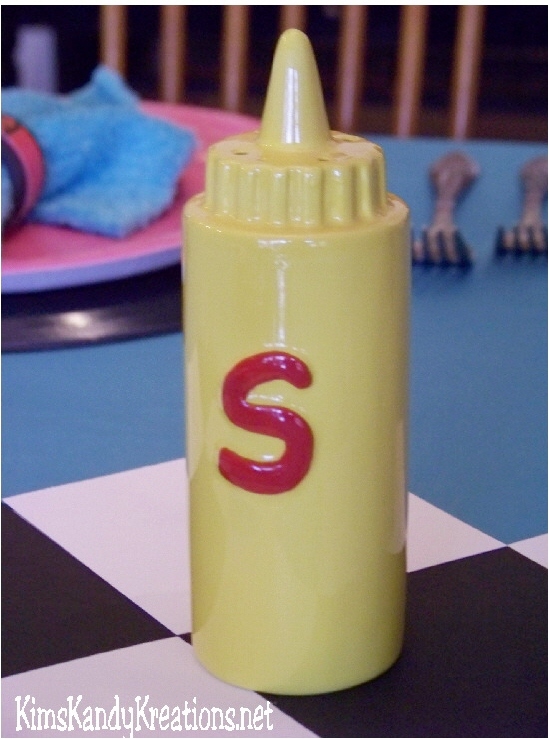 I found these great ceramic Salt and Pepper shakers at Hallmark. I just LOVE them! They look like old fashioned Ketchup and Mustard containers so they fit perfectly with the 50s Diner Theme. 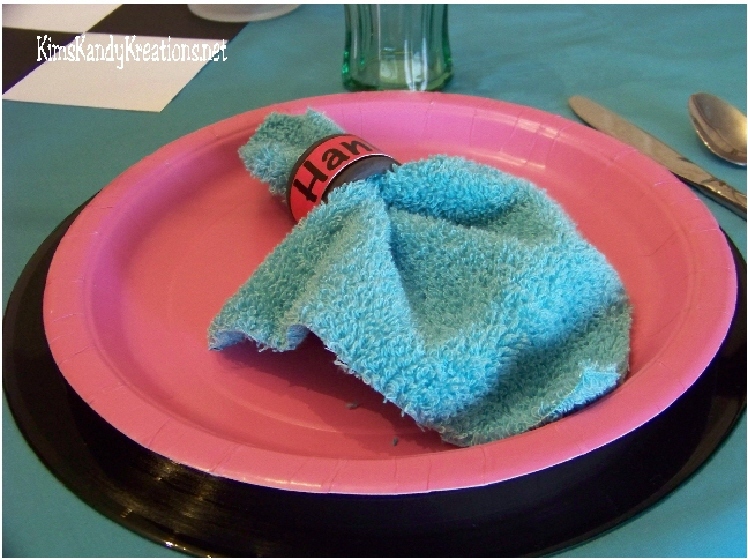 For each place setting, I used a large record I bought from my local Goodwill as a plate charger. 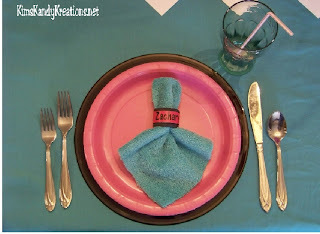 I finished off my place setting with silverware and my napkins and napkin rings. I REALLY love the way the whole thing worked out. This is just adorable! 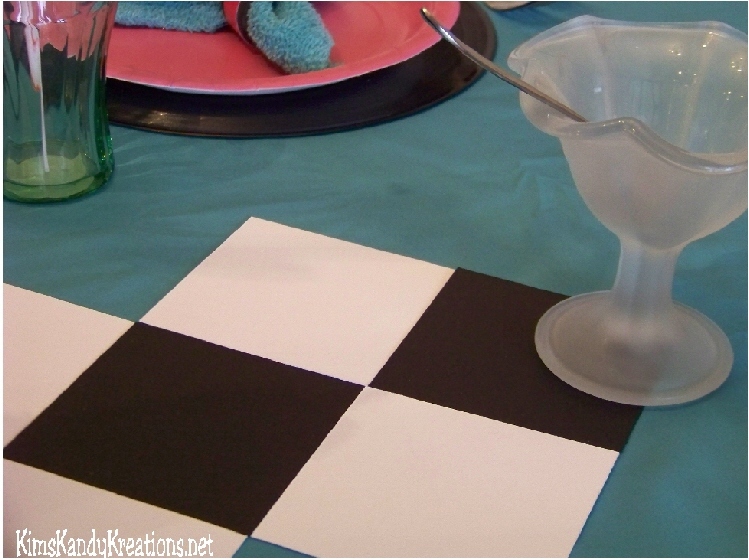 Great idea, using a sheet for a tablecloth to get just the right color, and the checkerboard runner looks fabulous. TOO cute to use a record as a charger -- now I'm wishing we hadn't given all ours away. 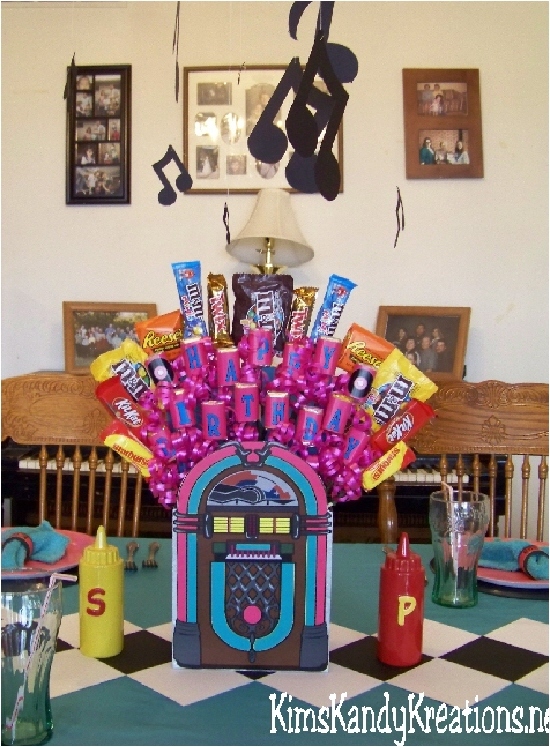 I need to go read about how you made that darling jukebox! Your patience must run VERY long!!! You made both the jukebox AND the runner?!??!!! Bravo! 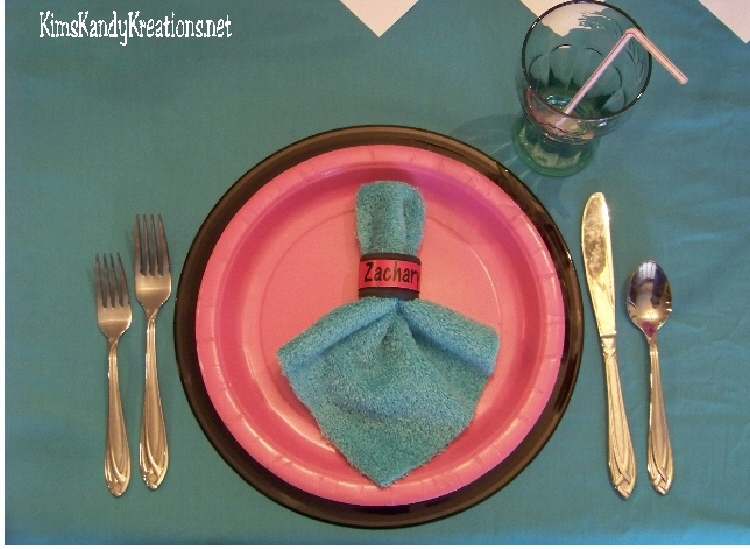 Very cute tablescape. The candy centerpc is adorable. What a great idea. 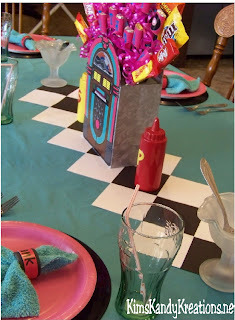 i really like this tablescape. 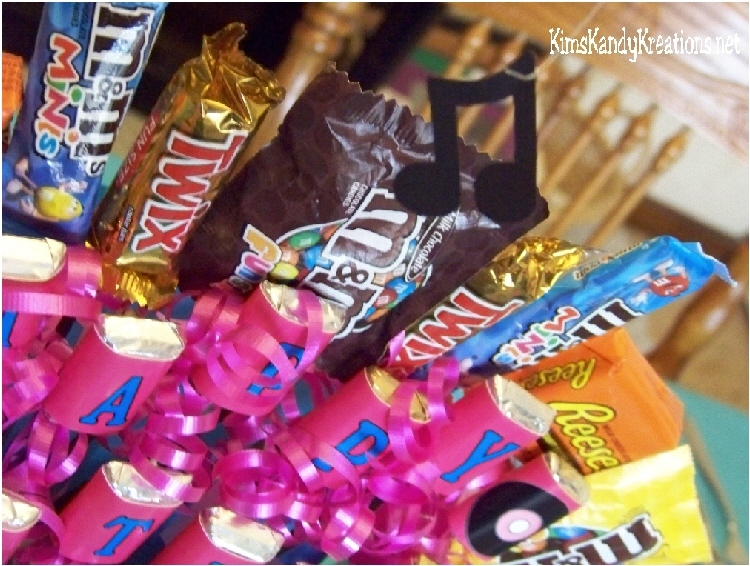 it is fun and creative! 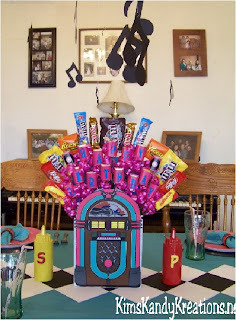 my favorite is the jukebox, very clever and eyecatching! thank you for sharing your ideas and instructions!